I live on the third storey of a 16-storey HDB block. To warm up before my regular jog, I usually climb the stairs to the top of the block and then take the lift down. On Tuesday evening, the lift door opened and I was startled by a large moth flying around inside. How did it get in there? I was paralysed for a second. Should I take the lift with the flailing moth? What if it careened into my face? In my eyes? Or worse, my mouth? The last thing I want is a moth in my mouth in the month of May. What would my mother say? Maybe I should let the lift go and take the stairs down instead. Since this is 2014, I decided to take a selfie with the moth first. But I wasn’t quick enough. By the time I got my iPhone camera ready, the moth had fluttered out of the lift and into the night. I was disappointed with my slow reaction. My wife had told me a few days earlier that she and our daughter had also encountered a moth in the lift. I wondered if it was the same one. A photo would have confirmed its identity. Now I would never know. So I went for my jog with a heaviness in my heart. About an hour later, I returned home to a sight more chilling than a letter of demand from the prime minister’s lawyer. Outside my flat, a large moth was perched above my front door. Could it be the same moth? How did it find out where I live? Could it be the same creature that harassed my wife and daughter a few days earlier? Oh my god, my family was being stalked by a psycho-moth! This time, I did take a picture of the moth with my iPhone but was so rattled, I forgot to make it a selfie. Careful not to let the insect follow me, I calmly went inside my flat and told my wife about our winged stalker and showed her the picture. She didn’t freak out like I thought she would. I was a little frustrated that she didn’t seem to be taking the threat of the psycho-moth very seriously. Before I went to sleep that night, I double-checked that all the doors and windows were tightly shut. In case the psycho-moth had figured how to turn door knobs (and managed to get a duplicate of my house key), the front door was also latched from the inside. That night, I slept dreaming I was an obese Godzilla battling two giant moth-like monsters. No, wait, that was just a movie I saw the previous week. That guy who plays Bryan Cranston’s adult son is a terrible actor. 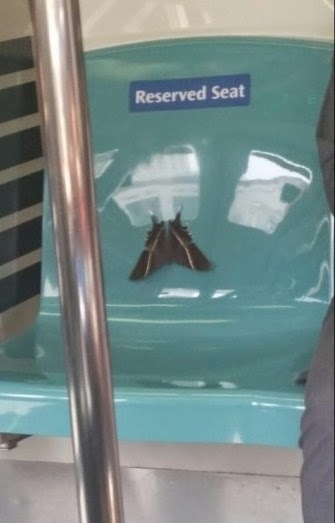 After surviving the night, I woke up the next morning to check my Facebook page and discovered that other people had also encountered the moth in other parts of Singapore. Oh. So it wasn’t just me. There were many moths. There was no single psycho-moth stalking my family. 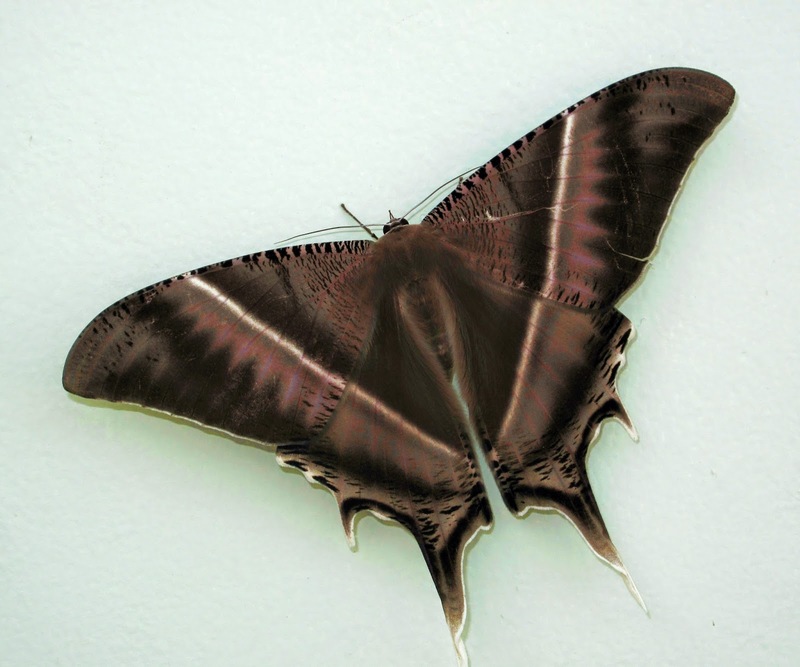 The species is known as lyssa zampa or the tropical swallowtail moth. I also read that it has a lifespan of only two weeks and that made me feel kind of sad. How to reach the CPF minimum sum like that? It made me wonder what I would do with my life if I had only two weeks to live. I’d probably take even more selfies. If I die in two weeks, I wouldn’t live to see a nationalised public transport system or the release of iPhone 6. I wouldn’t get to watch the new Transformers movie with my daughter. But at least in two weeks, I’d be able to complete my McDonald’s Hello Kitty Bubbly World collection. That’s right. I’m going there. A campaign was launched earlier this month to encourage Singaporeans to talk about the usually taboo subject of kicking the bucket. The campaign is not-so-subtly called “Die Die Must Say”. The trouble is that the entire campaign seems to consist of a way-too-perky music video of the Die Die Must Say theme song featuring a Hokkien rap, and a series of Chinese getai shows, which targets only the audience of such shows. What about those who don’t watch getai shows? Or understand Hokkien rap? Why are we being left out of this deathly campaign? Could it be mere coincidence that the campaign coincides with the sightings of the moths, which some consider a symbol of death? On Friday, I climbed the stairs again and on the 16th storey, I saw another moth. I don’t know if it was my “psycho-moth”, but instead of flying around, it was lying motionless on the floor in front of the lift. I wasn't sure if it was dead, but I decided to take a chance. I lay on the floor next to it and finally got my moth selfie.